EUGENE LEMCIO, professor emeritus of New Testament, has contributed the chapter on Revelation to A Compact Guide to the Whole Bible (Baker, 2015) written by members of SPU’s School of Theology faculty. MICHAEL MACDONALD, professor emeritus of European studies, German, and philosophy, retired in 2007 after 40 years full-time, still teaches the SPU spring C.S. Lewis class, takes a yearly “study leave” to Europe, loves his weekly church good books group, and continues to dream about taking students and alums to Europe. In 1953, Ted Olsen opened the College Barber Shop across from Tiffany Loop at Seattle Pacific College. In 1958, Ted’s son, Lyle, was given his own chair, and in 1984, Lyle’s daughter, Lynn, completed the family tradition by opening her own business in the space. Although not officially affiliated with Seattle Pacific, the College Barber Shop, now Styling Etc. 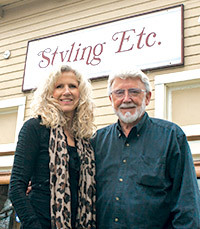 (Lyle) and Best Image Salon (Lynn), has served hundreds from the University community over its 60-plus years, including athletes, coaches, professors, and even former presidents such as C. Hoyt Watson and C. Dorr Demaray. Read the full story.